Zucchini balls taste exactly like zucchini. The only difference is that they grow in the shape of a ball. The round ball shape makes them ideal to bake stuffed or sliced into round disc shapes and grilled with garlic or used in a vegetable stack. Over the weekend just gone, I was lucky enough to meet the growers of Ball Zucchini, John and Debbie Berlin. John and Debbie are Queensland growers who specialise in spaghetti squash and they also grow these cute zucchini balls. All of their produce is pesticide (spray) free. Their produce (including zucchini balls) is readily available in Brisbane and often shipped interstate also. If you are in Australia, you can contact John and Debbie Berlin via their facebook page if you want more information about their produce or to find out if they supply to stores in your state or near you. If you are not keen on mexican pulled chicken, you can substitute with your favourite casserole or curry. Slice the top off the ball zucchini. Using a spoon, carefully scoop out the seeds and flesh of the ball zucchini so that it forms a nice pot. Using your fingers, rub the coconut oil around the inside of the ball zucchini pots. Place the ball zucchini pots & lids onto the baking tray and place in the oven for 10 minutes. Remove the zucchini pots from the oven and fill with mexican pulled chicken. Return to the oven and cook for another 10-15 minutes. Whilst the zucchini pots are in the oven cooking, place the avocado in a food processor (or use a stick mixer) to blend until smooth. Remmove the zucchini pots from the oven and evenly spread the avocado mixture onto the top of each of the zucchini pots. Garnish with chopped red chilli & spring onion (optional). 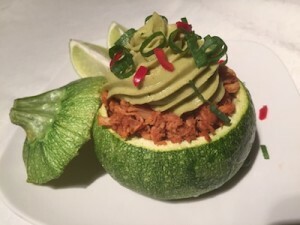 Serve with a slice of lime (optional).